I met William Klein...I can go home now! The madness of the festival is now over, I can reflect and sleep. My highlights, besides meeting and seeing the amazing work of William Klein, was hanging out with Bill Allard, and seeing his incredible retrospective ( I urge you all to buy his new book on 5 decades of photography and stories). I really liked the exhibitions of Cedric Gerbehaye on the Congo, the best I've seen from this region, Antonio Bolfo's work on the NYC police force, Andrea Star Reese's The Urban Cave and Tomas Van Houtryve's work around the last Communist countries. 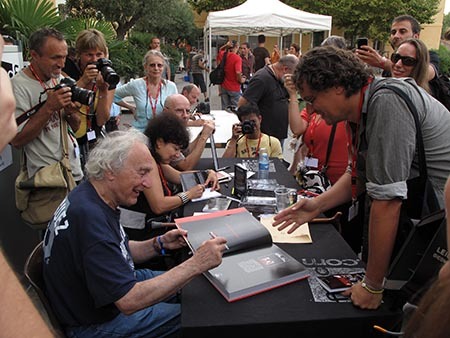 Me next to William Klein as he is signing a book for Robert Pledge, Couvent de Minimes, Visa Festival, Perpignan, September 4, 2010. William Klein signing book for Paolo Pellegrin at Visa Pour L'Image, 2010.